Eden Rise Pharmasave Pharmacy services the communities of Berwick, Officer, Clyde, Narre Warren, Cranbourne, Hallam and surrounding areas. Our pharmacy is owned by seven pharmacists Darren Pountney, Kelly Pountney, Pete Tzimos, Stav Mantas-Tzimos, Janette Beecroft, Grahame Beecroft and Stephen Chan and backed up by a great team of experienced pharmacists, pharmacy technicians and pharmacy assistants. If you would like to speak to any of our team please call in or phone the pharmacy on 8974 7920. Our pharmacy is an approved training site for university students studying pharmacy and most years we employ a pre-registration pharmacist. Eden Rise Pharmacy is a member of the Pharmaceutical Society of Australia and the Pharmacy Guild of Australia. The pharmacy is fully accredited under the national Quality Care Pharmacy Program and is a member of the Pharmasave group. Being healthy is the cornerstone of a happy and productive life and at Eden Rise Pharmacy we can help you achieve your health goals. Sometimes a good diet, the right amount of exercise and a positive outlook are still not enough to ensure your optimum health and well-being. We can become unwell with an infection, we might sustain an injury or we may develop a chronic illness and along with the advice of your doctor, your pharmacist can assist you to get the most out of your medicines so that you can achieve your best health outcomes. We think it’s a sensible idea to develop an ongoing relationship with your preferred pharmacy, particularly if you have a chronic medical condition. When you use the same pharmacy regularly, your pharmacist can view your entire medicines history and see how you have been managing your medicines. Sometimes your pharmacist may talk to your doctor about your medicines – perhaps you have side effects or an alternative medicine might be considered. Your pharmacist can help you understand your medicines better – we can all access information online but this information needs to be put in context for you as an individual patient. Sometimes common medical problems can be a sign that further investigation is required and our pharmacists may recommend that you visit your doctor. 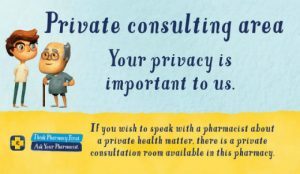 We have private consulting spaces to allow you to speak to a pharmacist privately. We can offer many other professional services to improve the way you manage your health. In partnership with your doctor and if you are taking several medications, a Home Medicines Review can provide an independent overview of the way in which you manage your medicines. We can provide blister packs (medicopacks) with your own weekly medicines securely sealed for different times of the day. Using a medicopack can help you take your medicines as your doctor intended – not too many or too few. We store your repeat forms in the pharmacy and avoid the problem of missing prescriptions and we can let you know when your repeats are running low. Please read through our website to learn more about us at Eden Rise Pharmacy; we are proud to be part of the Berwick community and whether we can help you once a year or every week, your health and wellbeing are our priority. The new co-payments are $40.30 for general patients and $6.50 for concessional patients. Rises reflect a 1.3% CPI indexation (rounded up to the nearest 10 cents) which is lower that has been seen in recent years. This policy applies to all purchases made from Eden Rise PharmaSave Pharmacy. For the right to a return, exchange or refund, the register receipt or a tax invoice from Eden Rise pharmacies must be presented as a proof of purchase. If the product is faulty or of unacceptable quality, or it does not match the sample, or the descriptions made by a staff member, on packaging and labels, or in any promotions about its performance, conditions or quality, then you may request a replacement (for minor problems) or refund (for major problems – e.g. product is unsafe or it is a problem that would have stopped you from buying it if you had known about it). If the product is faulty, you do not need to return the product in its original packaging in order to get a refund. We reserve the right to not offer a refund if you have simply changed your mind, found it cheaper elsewhere, or have decided you do not like the purchase or have no use for it. Please be aware that you have 30 days to return an item (exclusions apply) for consideration of a full refund or exchange (at our discretion) for change of mind purchases, as long as the product is returned in a saleable condition and with accompanying proof of purchase. Saleable condition means that the item must not have been opened or used, it must still be in its original packaging, and all manuals, instructions and accessories must be included. If you are unable to provide the register receipt or tax invoice as a proof of purchase and the item is available in other stores, we are unable to provide you with a refund or exchange. The refund will be provided using your original payment method.